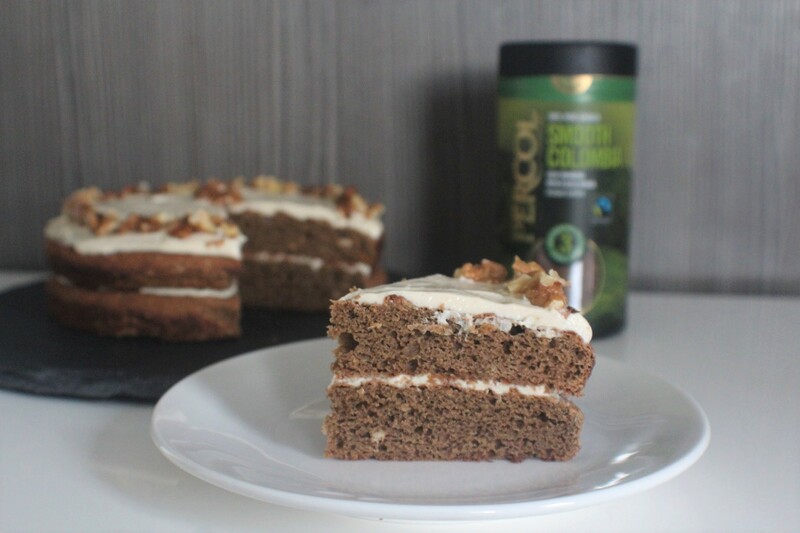 It’s time for another recipe working with Percol Coffee as one of their recipe creators! 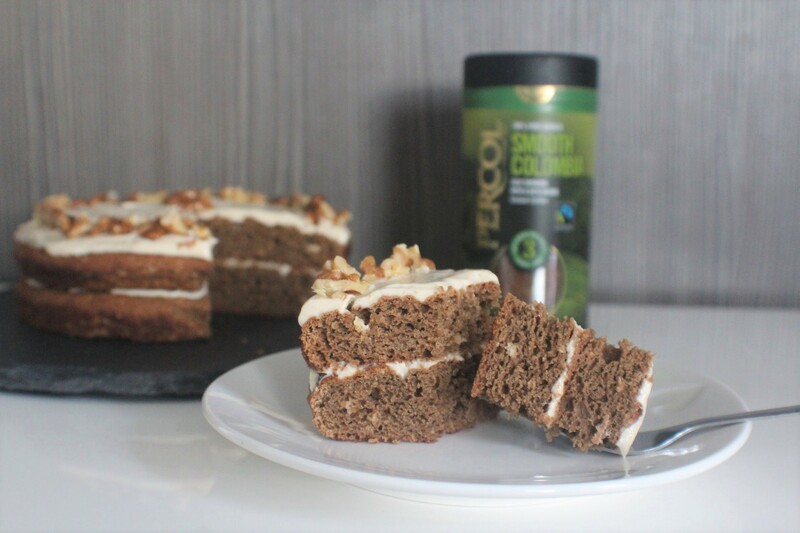 Last month it was all about these Caramel, Hazelnut & Coffee Tartlets with Chocolate Ganache which went down a storm both at home and via social media; this month it’s time for a healthy twist on a classic: Coffee & Walnut Cake. 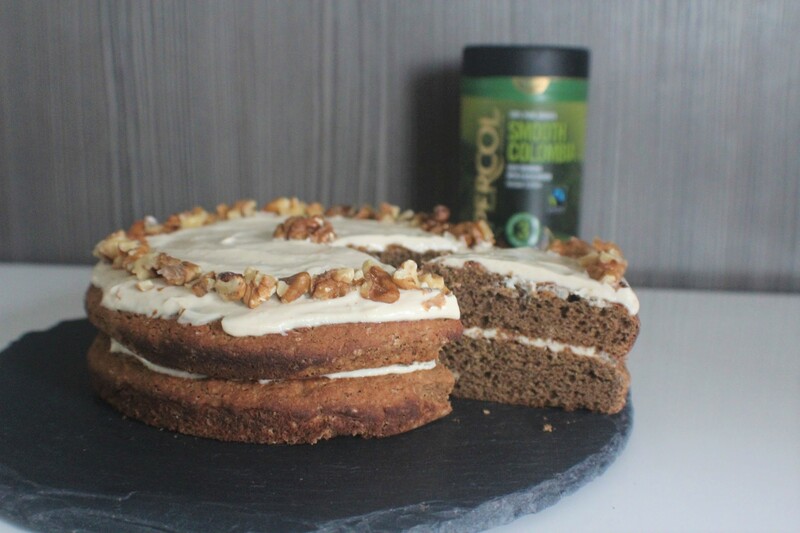 With no refined sugar, good fats from the coconut oil and almonds and oats providing slow-releasing carbohydrates, this delicious Smooth Colombia coffee-infused gluten-free sponge layered with a fat-free frosting is ideal served for afternoon tea or a weekend treat. Let’s get onto the recipe! Preheat the oven to 180 degrees C and grease and line 2 x 18cm cake tins. Gently melt the coconut oil then set aside for 10 minutes to allow to cool slightly. At the same time dissolve the coffee with 1 tablespoon boiling water and allow to cool. 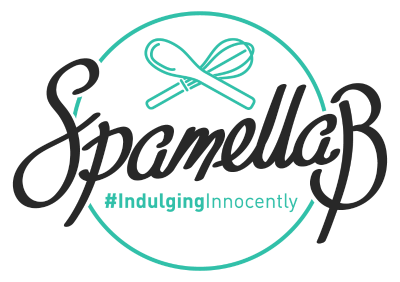 Now place the melted oil in a bowl with the coconut sugar and use an electric whisk to beat together for 2 minutes. Add the eggs one at a time and continue to whisk until frothy and smooth, then add the cooled dissolved coffee, vanilla and maple syrup or date nectar. Now carefully fold in all the dry ingredients and stir to combine (don’t overmix!). Divide the batter between the two cake tins and smooth out evenly. Bake for 18-20 minutes until risen and spongy then leave to cool. Meanwhile make the frosting: Dissolve the coffee in ½ teaspoon of boiling water and leave to cool, then beat into the yogurt with the date nectar or maple syrup and vanilla. Leave in the fridge until needed. 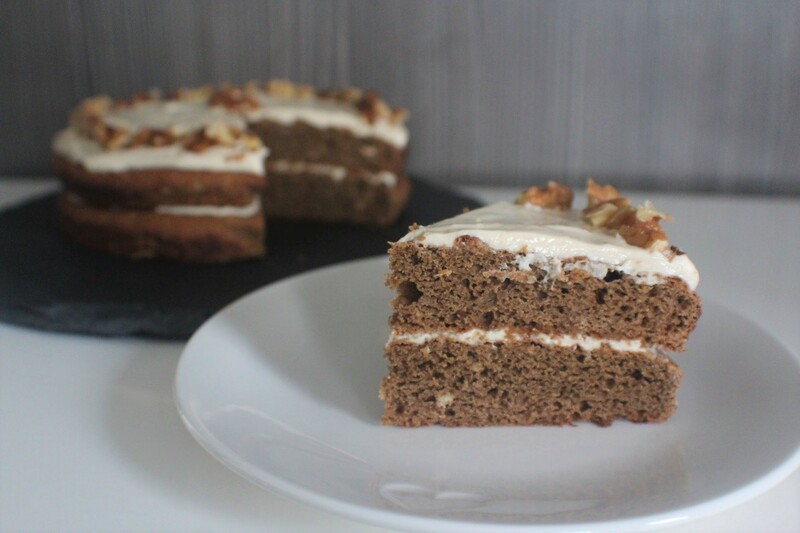 Once the cakes have cooled, spread half of the frosting over the top of one cake then place the other on top. Spread the remaining frosting to cover, then sprinkle over the walnuts. Now slice up and serve! 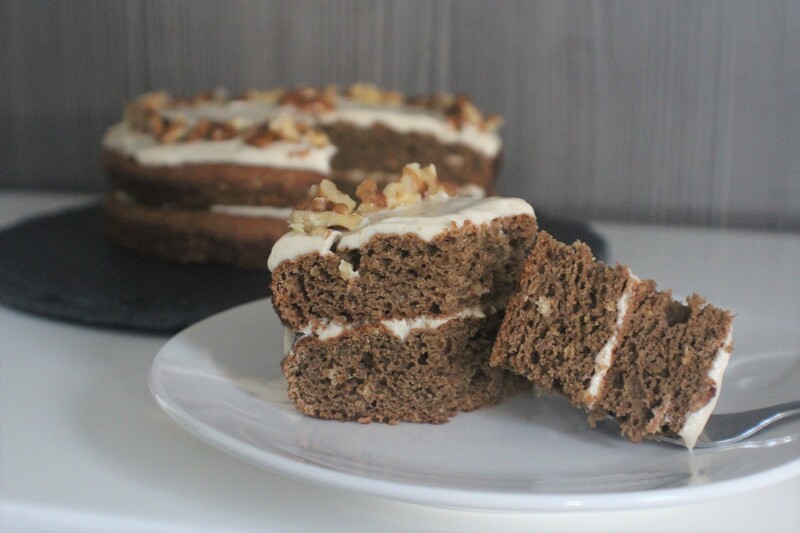 This cake (frosted) is best eaten on the day it is made, but it can be stored in the fridge in an airtight container and enjoyed the next day too.